I've been wanting to roast this pork loin shoulder joint which arrived in my parcel from Love Pork for sometime but it's a large joint for just the two of us. Last night, we had guests for dinner including my crackling loving Dad and I wanted to show off with some light, puffy super crispy crackling. This pork joint is the ultimate self basting roast which means you don't have to hover around the oven basting it every ten minutes. 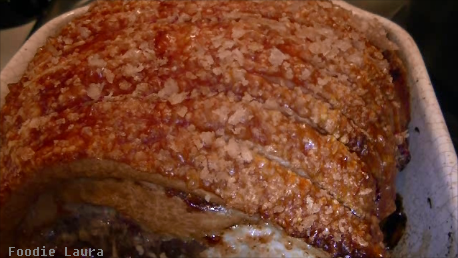 I know not everyone is a crackling fan and I have to admit I was a late convert after some soggy leathery experiences with greasy pork scratchings put me off but do not even think of removing the fat before cooking as that's a sure fire way to end up with a dry pork joint. 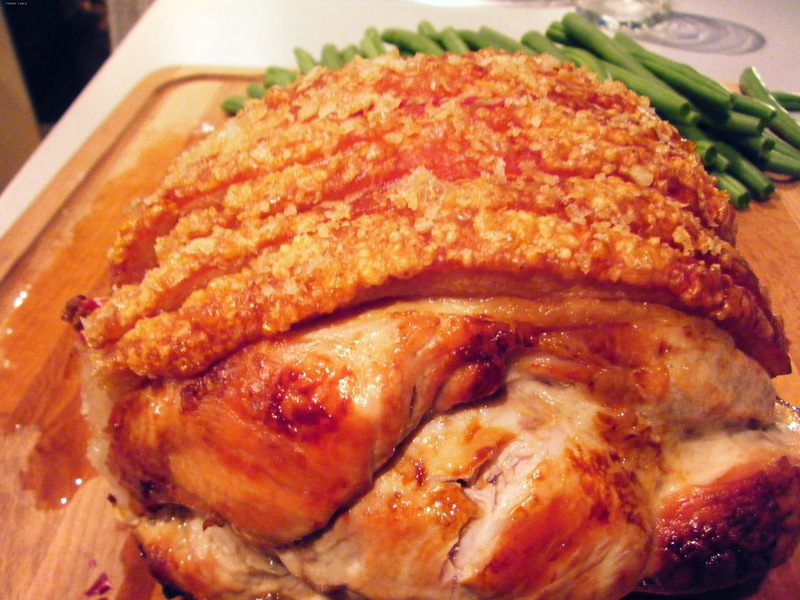 This blistering beauty is what I turned out and here's how you can get perfect crackling every time. Deeply score the joint through the fat. The joint I have used was already scored and the cuts were around 1cm apart. Dry the joint off and brush it with olive oil, I used a silicone brush and made sure to get oil down into the scored areas. Then sprinkle the pork joint liberally with salt flakes. I've been experimenting recently with salt flakes and find that I really like the soft texture of British salt like Maldon or Cornwall sea salt. The flakes are pleasingly white too which is the colour I think salt should be. 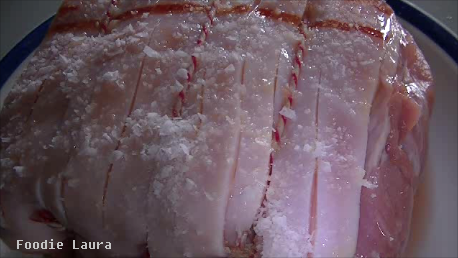 The salt helps draw the moisture out of the fat making it extra crispy. Do not baste the joint as the juices you would pour over the meat are just going to soften your crispy crackling. 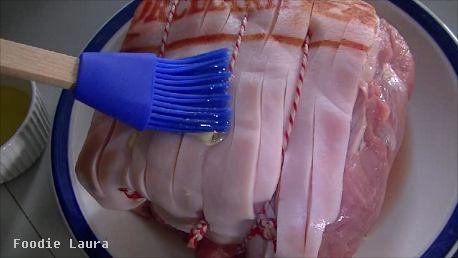 Look at that gorgeous fat on your pork joint, that will do all the basting work for you while the joint is cooking. Then reduce the heat. This pork joint cooked at 190C for a further hour. Love Pork has full details on roasting times here. Finally, allow the joint to cook for 15 minutes before carving. *I am a Hambassador for Love Pork and they sent me this pork joint along with several other select pork cuts.